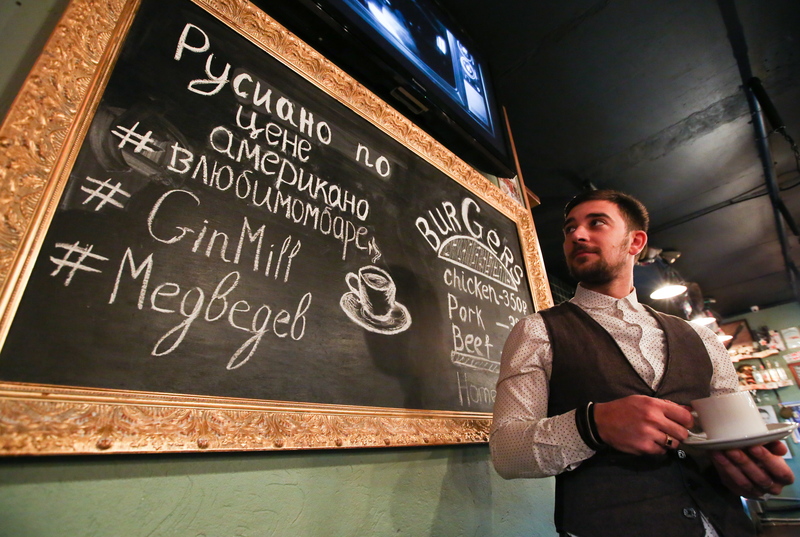 Ryazan's Gin Mill 29 bar offers "Rusiano" coffee. Coffee memes are trending on Russian social media about Russian Prime Minister Dmitry Medvedev suggested renaming Americano coffee to "Russiano." Medvedev did not make the recommendation, but Russiano has already appeared in Moscow's cafes. Due to the similarity of their voices in the video, Medvedev was credited with the new moniker, and people who did not see the video even took the prime minister seriously. "Renaming the American coffee 'Russiano' is a great idea. It would also be good to take Medvedev's iPhone and replace it with a YotaPhone," proposed blogger Dyadyushka Shu, remembering Russia's first smartphone. The YotaPhone's design resembled the Apple device, and was presented to Medvedev with pomp and circumstance in 2013. However, the prime minister never began using the domestic product, and still uses an iPhone. Sergei Smirnov, editor-in-chief of Mediazone, thought the joke was intentional, linking it to Medvedev's desire to break up the negative news circulating that moment. A day earlier, Minister of Economic Development Alexei Ulyukayevwas first detained and then arrested. "Medvedev should be given credit. He did a good job inventing Russiano. It's better to be associated with this now than with Ulyukayev's arrest," said Smirnov. "In response to the arrest of his minister for a $2 million bribe, Medvedev suggested renaming the American coffee Russiano. Great," wrote @YraSunrise. Russia's Trump parody account @DonaldTrumpRF also reacted, rephrasing the U.S. president-elect's election slogan: "Make Americano great again!" — Дональд Трамп (@DonaldTrumpRF) 16 ноября 2016 г. "I drank a Russo Espresso in one bar. It consisted of coffee, liqueur and a lot of rum. Medvedev's Russiano is from the same cafe, I guess," wrote @shaggy_bruin. — zhgun (@zhgun) 17 ноября 2016 г.